It's common for home owners to wonder: How much is my house worth? Your home value depends on the type of valuation. Homes are valued in different ways and for different reasons. There's appraised value, assessed value, fair market price, replacement value, and actual cash value. These different types of home valuations vary by who conducts them, why they're needed, and how they affect your home insurance rates and coverage. Not all of these home valuations directly affect home insurance. However, even if it doesn't relate to your home insurance, it's still a good idea to review your home insurance policy if you find any of these values increased or even decreased. You want to make sure you have enough home dwelling insurance coverage. You don't want to lose your house in a fire and find it was only insured for half of its value. Many factors that go into a home's value: location, age, building materials, condition, size, and nearby property values and home sales. For instance, if multiple homes sold in your neighborhood well over the asking price recently, you can expect your home's value will increase. About appraised value: Mortgage lenders choose a professional appraiser to evaluate a property's value. The borrower typically pays for the appraisal. Mortgage lenders use the appraisal to determine mortgages, such as how much a person can borrow and loan lengths. The appraised value is used both for new mortgages as well as other types of borrowing in which you may put the house down as collateral. A lender will use the appraisal to figure out the loan to value (LTV) ratio. The LTV is typically kept below 80%. A higher LTV may prevent borrowing or require the person to get mortgage insurance. A low appraised value can also affect whether a homebuyer can take out a mortgage. In fact, you may find the appraised value of a home is much different from its market value. That difference can affect whether you get a mortgage. Let's say you agreed to pay $400,000 for a home, but the appraisal says it's only worth $300,000, the lender may not grant a mortgage in that case, especially if the amount of the loan exceeds the value of the home. About assessed value: Governments use assessed value to figure out what to charge you for property taxes. This is usually lower than the appraised value and market value. In other words, don't fret if you paid $500,000 for a home and the assessed value comes back $350,000. Look on the bright side -- a lower assessed value means you pay less in taxes than what your home is worth on the market. The appraised value analyzes nearby home sales and values, improvements, and new additions to your home, size, and condition. The government will create an assessed value and then calculate your property taxes based on the community or county's property tax rate. Assessed value is especially important in states with no sales or income tax. These states can have higher property taxes than a similar state with an income or sales tax. About fair market value of home: Fair market value is what a property is worth on the market. So, pretty much it means "what would a prospective homebuyer spend to purchase this property?" The fair market value tries to take out the emotion from the worth of a home. Sure, you may have raised your kids there, and it's special to you, but what someone might actually spend on the home could be quite different. Fair market value can increase or decrease widely after the purchase. For instance, maybe your community built a new high school. That likely increased your taxes, but it also probably increased the fair market value of your home. New schools bring new families, which can heat up a local housing market. 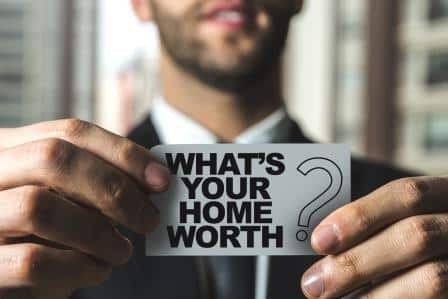 To figure out fair market value, you'd want to see the home's purchase price (if the home was purchased within the past few years), what similar nearby homes are costing and the state of the home and property. One word of warning: fair market value is all about now. You may have bought a home for $400,000 a decade ago, but that doesn't mean it's worth that anymore in the current housing market. About replacement value: The replacement value is what it would cost to replace your home and belongings if it's destroyed. Home insurance policies with replacement value usually cost more than actual cash value. That's because the insurer is agreeing to provide money to replace your home with similar materials and belongings. Depreciation is not taken into account. Figuring out the replacement value of your home can be challenging, but its integral to your policy as its tied to your dwelling coverage amount, and not having an accurate number can leave you underinsured. Read our guide on how to calculate replacement value of your house for more details. Replacement value is different from fair market value. Fair market value is how much the home would be sold for in its current condition. Replacement value is money to rebuild or replace a destroyed home. About actual cash value: The actual cash value is what it would cost to replace your home in its current state. Not the value if it was new, but the value to replace the current, depreciated version. The actual cash value is usually cheaper than replacement value since the insurer is only agreeing to reimburse you for what your home is worth. Not what it would cost to replace it. Actual cash value takes into account depreciation. So, you'd consider the age of the home and the expected lifespan of the home. For instance, insurance companies usually want homeowners to replace their roofs every 20 years. If your home has a roof approaching two decades, the actual cash value of the structure will be lower. Replacement value doesn't take that into account. As you can see, home valuations can fluctuate depending on the situation. You'll likely come across the different types of home valuations during your lifetime when you buy a home, refinance a mortgage or apply for a home equity line of credit. However, if you need a valuation for insurance purposes, an insurance company will likely use replacement cost or actual cash value.